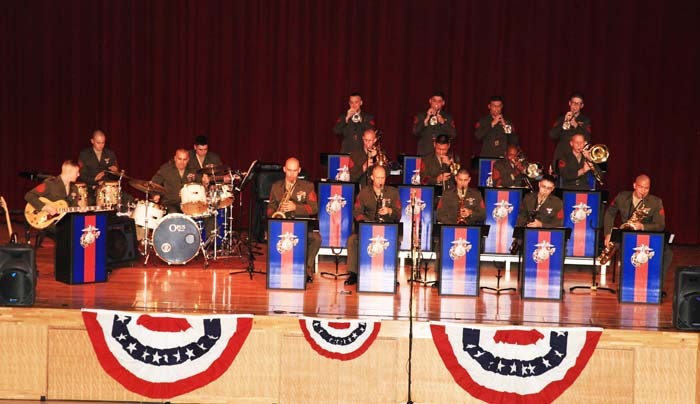 The III MEF Big Band will join forces with the 15th JGSDF Band on Sat., Sep. 10th. For a small, unassuming place such as Okinawa, it is worth noting the tenacity with which the subtropical gem has held onto and preserved uniquely Okinawan traditions in spite of its turbulent past as a spoil of rivaling empires’ conquests at sea. From culinary specialties such as Okinawa soba to the omnipresent spiritual guardians known as shisa and the majesty of Shuri Castle, tradition lives on here. Initially presented as a short wind ensemble performance with members of each band intermingling with one another, the event quickly became a huge hit with the community, and secured its place as an Okinawan tradition ever since. The event’s success soon allowed for the creation of a longer presentation in which each band would perform a segment on its own, concluding with a collaborative portion featuring the combined, double-size band. This year’s concert will follow the same format, with an overarching Latin-themed program on the docket along with a few American and Japanese pieces. Arturo Marquez’s passionate Danzon No. 2, an energetic salsa rendition of the traditional Okinawan folk song Shimanchu nu Takara, and selections from Robert Russell Bennett’s intricate homage to classic American dance styles, entitled Suite of Old American Dances, are a few works in the evening’s line-up. GySgt Michael Stanley, who is the Enlisted Conductor of the III MEF Band, notes that, “This event presents a rare opportunity for senior leaders from both militaries to come together in a social setting.” He also points out that the III MEF Band owes a great deal of its relationships within the Okinawan community to its connection with the 15th Band. This event enables us to “send a message that we’re a part of this community,” says Stanley. This year, the III MEF Band welcomes their new Band Officer, CWO 2 Andres Gustavo Navarro, to the podium in his debut performance with the band. The 21st Annual Combined Band Concert takes place on Saturday, Sep. 10, 2016 at 19:00 at Okinawa City Civic Center. Tickets are free and available to pick up at the III MEF Band Hall, located between the Ocean Breeze and the Foster Community Center. For more information, or to reserve tickets please call the III MEF Band at 098-970-3919. Free numbered tickets are available at Okinawa City Civic Hall and Okinawa Convention Center, Fukuhara Music (Goya, Okinawa City), Teruya Music Store (Chuo Okinawa City), Takara Music Store (Makishi, Naha), Atelier Winds (Shuri, Naha) and Sound Craft (Yogi, Naha City).